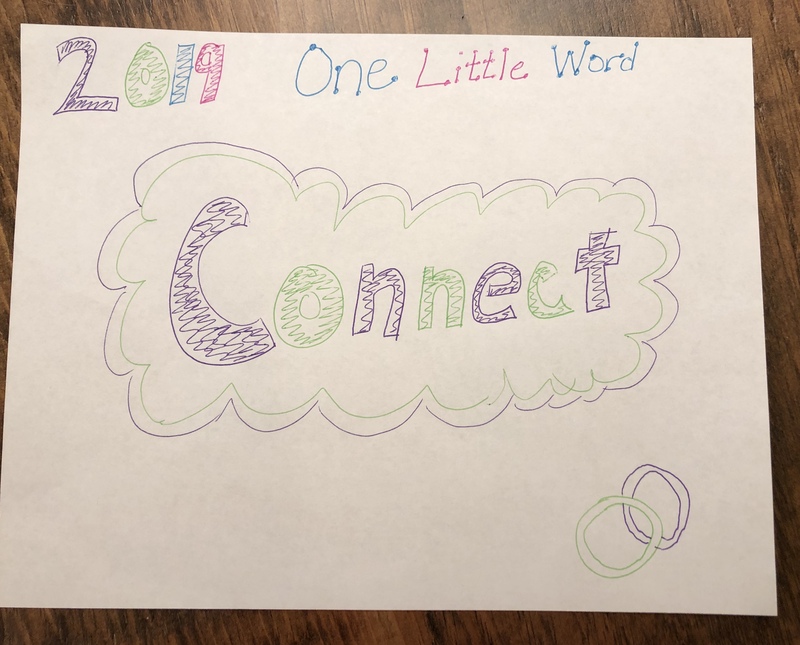 Yesterday, I unveiled my “one little word” for 2019 – CONNECT. I want to be more intentional about the connections I already have or plan to create in my life this year. Some of you know that I began attending a gym about four years ago. I was looking for something that I would enjoy going to, someplace or someone to hold me accountable. I was looking for something beyond the “box gyms” and all of their equipment. I had the same equipment at home and I never used it. I found a Groupon for Prime Fitness and decided to check it out. Prime became exactly what I was looking for! With Prime, I found my tribe. 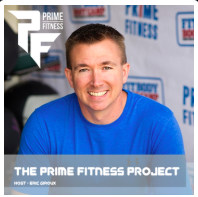 Eric, one of the co-owners, just began a podcast and I’m honored that he asked my friend Greselda and me to be his first guests on The Prime Fitness Project. Take a listen to hear about my health and fitness journey so far. My hope is that you will hear my story, and while your story might be different, you might find a connection in some way. I also read Girl, Wash Your Face by Rachel Hollis over winter break. What a motivating force to be reckoned with. I appreciate Rachel’s candor with the lies that women tend to tell themselves. She is relatable and I could connect to many of the lies she told herself. It’s high time that women lift each other up. It’s time that we become support systems for our sisters and we stop dragging each other down. If you are looking for a little pick-me-up to start 2019 off on the right foot, check out Girl, Wash Your Face . 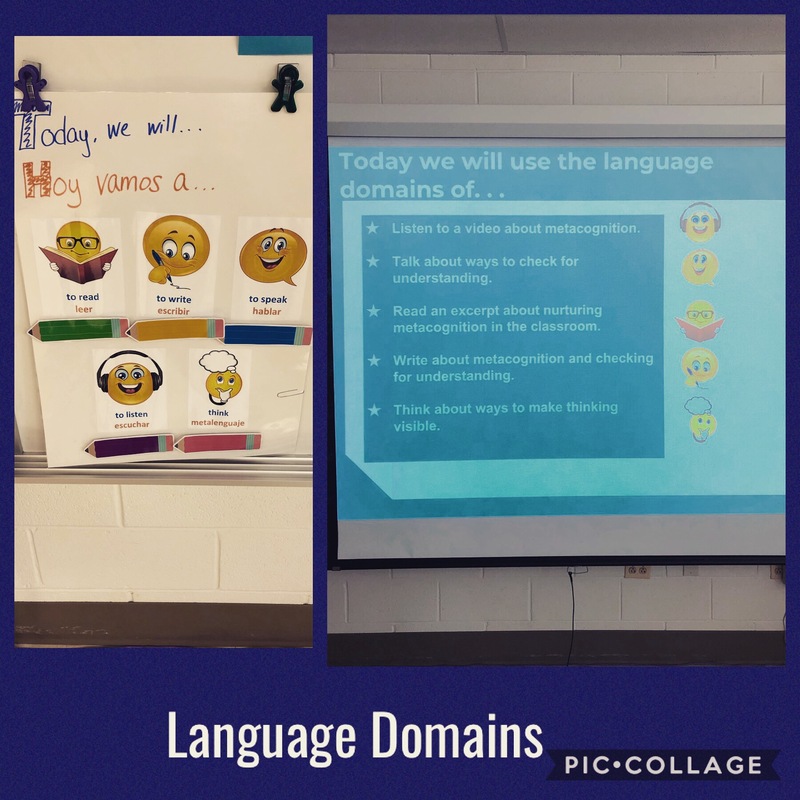 I reflected on all of this as I began to think about my “one little word” for 2019. I want to be sure to continue to build long-lasting relationships with people in my life, both personally and professionally. I want to make time for the things and the people that are important to me. I want to cherish these long days and short years with my children as much as possible. So for these reasons, the word I chose going in to 2019 is CONNECT. This year I chose a personal symbol as well. Chloe gave me a beautiful necklace for Christmas this year of two links hooked together. She told me it was symbolic of our love for each other, that even when we fight, we will always be connected! I have taken the two links hooked together as my personal symbol for this year. I want to make connections in every facet of my life. Yesterday, I shared my 19 for 2019 visual. I tried to tie some of my goals for 2019 into my “one little word”. See, making connections already! I’m a goal setter and last year, after learning about 18 for 2018, I set 18 goals for 2018. Now, while I pride myself on setting goals, I’m not the best at reaching all of my goals. . . yet! 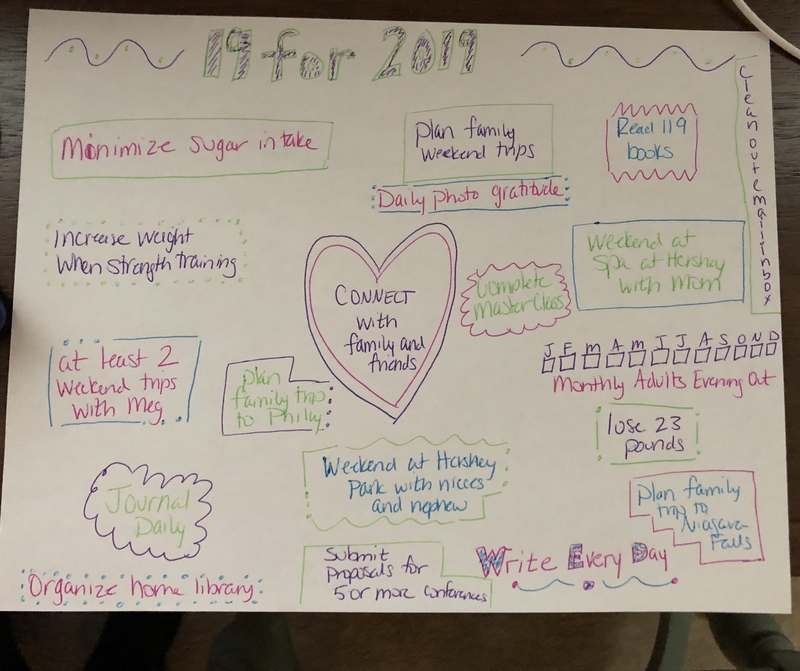 Today, I reflect on the goals I met, the goals I haven’t met. . .yet, and the goals I’m setting for myself for 2019.
monitor sugar intake – During a challenge at the gym in September, I was able to successfully monitor my sugar intake for about 3 weeks. Within those 3 weeks, I lost about 8 pounds, but more importantly, I was able to quit soda! I have not had a soda since September 18, 2018! get back in touch with creative side (craft, paint, re-purpose, etc.) I enjoyed many crafty activities in 2018, including beginning Pinterest Parties in which the participants create a craft based on a theme. weekend at Hotel Hershey (particularly the spa!) I was not able to schedule this in for 2018, so it’s on my list for 2019.
create accent wall in basement We did create an accent wall out of reclaimed wood in the basement. say “yes” to my kids more I tried this, but I’m not sure I was incredibly successful! Family Fun Friday Night once a month This, unfortunately, fizzled out pretty quickly in early 2018.
finish 3 puzzles and frame them Never even took the puzzles out of their boxes. plan family weekend trip to Philadelphia I wasn’t able to schedule this for 2018, so it’s on my list for 2019.
date night once a month We were able to get several date nights in during 2018, but I don’t think they were monthly. clean out email in-box (this is a doozy!!) I did not get to this, so it is on my 2019 list. read every day (2017 was not my best reading season) I did not read every day and 2018 wasn’t my best reading season either. I’ve set a new reading goal for 2019.
increase weight when strength training I started increasing the weight, but I stopped weight training regularly. I hope to get back to it in 2019.
watch Big, Little Lies I binge watched the first season and hope to be able to binge watch the 2nd season when it comes out in 2019.
write EVERY day I was unsuccessful at this, but hope to find, no make, more time for writing in 2019.
create family photo albums I created one family photo album. ONE! organize home library I was unsuccessful at this in 2018, so have added it to my 2019 goals. I hope that you are able to take some time to reflect on your 2018 and project what you would like to see in 2019. As the ball drops tonight on another year lived, I am hopeful that you find exactly what you are looking for in the new year! A few weeks ago, I did something scary. I made myself vulnerable to our staff in a meeting. I opened up about my adverse childhood experiences (ACEs). In the late 1990’s, a doctor from the CDC and a doctor from Kaiser Permanente set out to find connections between childhood experiences and lifelong health. They created a questionnaire and sent it to over 17,000 people in the Kaiser network. The results were astounding. The more adverse childhood experiences a person had, the more likely they were to have health issues. Someone with an ACE score of 4 had twice the risk of heart disease and cancer. Those with an ACE score of 6 or more, on average had 20 years lower life expectancy. Of course, ACE scores don’t tally the positive experiences in early life that can help build resilience and protect a child from the effects of trauma. Having a grandparent who loves the child or a teacher who understands and believes in the child may help mitigate the long-term effects of early trauma. So why did I share this information with our staff? Because many of our students are living with adverse childhood experiences right now. How can the adults in the building help? First, we need to be aware of the types of trauma that our students may be living with. Then, we need to arm ourselves with strategies to help our students build resilience and coping skills. If each staff member is “the one” for at least one student enduring trauma in the building, think about the impact we can make! My ACE score is 4. Thankfully, I had two teachers who took me under their wing and helped to mitigate the long-term effects of my early trauma. I’m fully aware that my life could have gone in a different direction. I’m also acutely sensitive to the trauma that our students endure, as a result of my own trauma. Last week, I finally had a chance to sit down and read Hey, Kiddo: How I Lost My Mother, Found My Father, and Dealt with Family Addiction by Jarrett J. Krosoczka. This is a timely and profoundly important memoir, that unfortunately too many of our students will see themselves in. 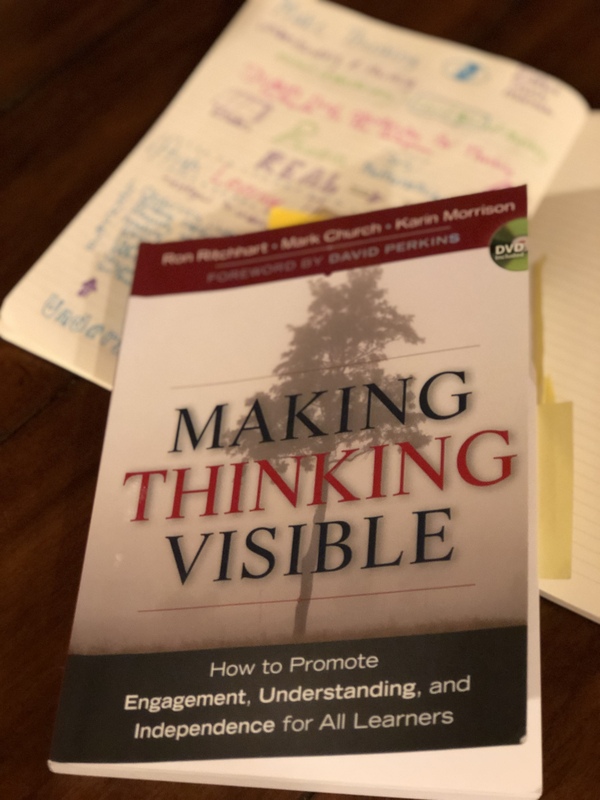 But, that is exactly why it is a necessary book for our middle school and high school students. Students who are living in a similar situation will see themselves in this graphic novel and will see how Jarrett was able to overcome his childhood trauma. 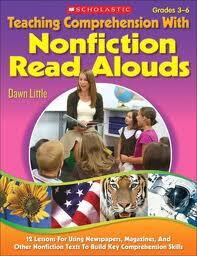 Other students will read Hey Kiddo! and will become aware of situations that some of their friends may be going through, perhaps building some empathy for their classmates. 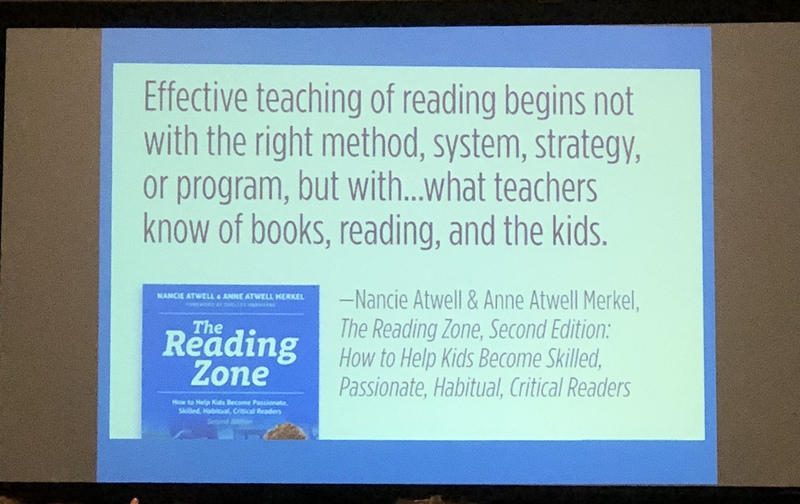 Think about the students in your classroom or building. Do you know them? I mean really know them? Do you know the trauma that some of them may endure in their homes? As we close out 2018 and begin to edge into 2019, I will think about how I can “be the one” for the students in my building. I hope you will do the same.